MIDI, Music and Keyboard Fun! We are actually creating this post about one week behind. Said another way we fired up the new Mac on Tuesday 12/26/17 and we are writing this post on 01/03/18. Over the past week, we have learned a ton but here are few things that we noticed within the first 15 minutes of playing on our shiny new Mac. Not a huge fan of the keyboard just yet. We prefer a little more tilt on the keyboard and the old keyboard also had a wrist pad. We have a glass desktop which means we now have a very smudged up glass desktop where we rest our hands in front of the keyboard. If there is one keyboard shortcut in macOS there must be thousands. Very handy and fast but it will take awhile to learn our favorites and blend them into our everyday workflow. One of the first we missed was “Ctrl-C” and “Ctrl-V” for the copy and paste functions. There is no “Ctrl” key on the Mac keyboard. There is a “control” key but it doesn’t do the same thing. Instead, it’s a key called “command”. Command-C or V or X works the same once you find the command key. What about the “Home” and “End” keys to get to the beginning/end of a line? No gots – Wait, what? Instead, you can use “command” and either the left or right arrow to accomplish the same thing. Again, a very subtle difference but you find yourself thinking about what to do vs. the instinctive keys you used in the past. Over the years we have changed out keyboards and there is always a bit of a learning curve. It seems like shift or some other key is just ever so slightly in a different position causing you to spend the next two weeks fumbling around retraining your fingers. Similarly, the mouse has ever so subtle differences and we are still much slower at getting things done. How ’bout no “right-click”? Well, actually you can change that but the default was “off”. Notice the middle checkbox where we turned on “Secondary click” and selected “right side”. Now it feels like our old Windows machine and we can quickly access the various second level menus that many items have available for things like delete, rename, copy, paste, etc.. I’m sure there is the Mac way of doing those things with the “left click only” mouse but no right click on the mouse was a little too big of a change for us. Are you used to using a scroll wheel in your mouse to navigate a web page or document? How about moving your finger up and down on the mouse surface instead? They call it a gesture and there are some others like using two fingers on the mouse and swiping left or right to scroll through full-screen apps you have open. One other one is a double tap with two fingers on the mouse to take you to “Mission Control”, a feature we have not spent much time with yet. Both of these next items are really small changes but you would be surprised how many times we are looking at the wrong spot on the screen. In the Windows world, you are trained to look at the bottom of the screen to access various things. Not so much on your Mac. Enter the top of the screen. You can’t imagine how many times in the past week I’ve glanced at the lower right of the screen to check the time only to find that it’s now in the upper right of the screen. One very nice feature also located in the top right is called “Finder”. Similar to the Windows Explorer function but we have found Finder on the Mac to be much faster to display results. There are a couple of ways to get access Finder and one of those is to simply click on the magnifying glass in the upper right menu bar to search for files or apps that you are having trouble locating. Notice the Apple logo – Very similar to the Start button in the Windows world and where you can select options like Sleep, Shutdown, Restart, Lock the screen, etc. None of these are showstoppers and I’m sure many of the things we mentioned can be customized. At this point, we are still running just about everything with the out-of-the-box settings. Overall, we feel that’s the best way to learn and discover where things are and how they work. The more we use the Mac the more we are learning the “new way” (aka the Mac way). There are tons of videos and articles online that discuss not only the couple of items we mentioned but hundreds of others that we have not run across yet. This entry was posted in Hardware, Software. Bookmark the permalink. Welcome to Mac. I also have had the same complaint about the flat keyboard. I have a long piece of marble (but wood would do the same job) placed under the top of the keyboard, which provides the slant I prefer. Also, may I suggest a good Logitech mouse? Never cared for the Apple Magic Mouse. Overall liking it so far. I had a Logitech on the PC that we were very happy with. For now, I’m sticking (struggling!) with the default Apple setup. Over the past couple of days, I’ve noticed that I’ve started getting a little more comfortable with the config. Still willing to give it a little more time before I swap out anything. 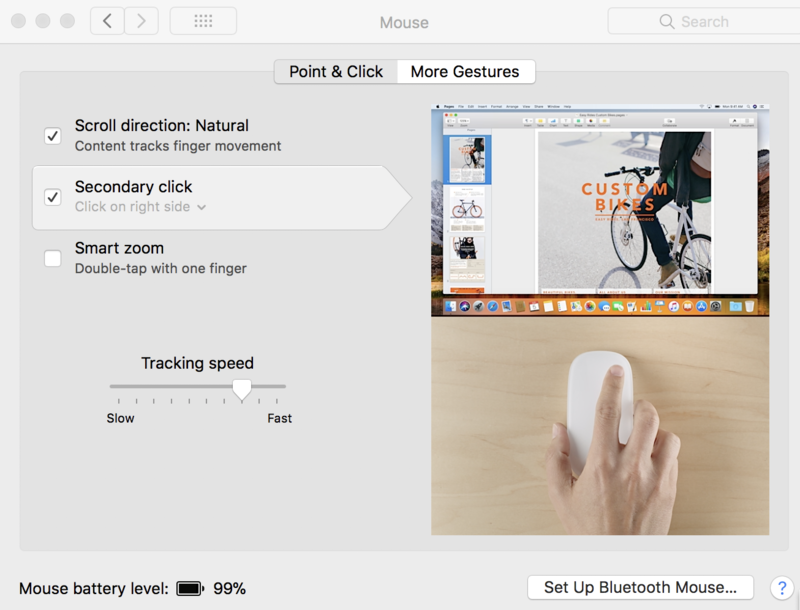 Bill – Thoughts on the trackpad? Next time I’m close to a Best Buy or an Apple store might take one for a test drive. Wondering if that could completely replace the mouse. I’m thinking it might be useful in Logic for some of the editing we do and easier than using the mouse for those tasks? I have a trackpad. It came with one of the Apple products I bought a few years back. I am not crazy about it, but I am a long-time mouse user–one with a scroll wheel!! Still, to be fair, many people love it. You can use anybody’s, not just Apple’s. There are settings to help you config any one you choose to use. I actually use mine to prop up my mouse! Creates the perfect angle for it! Get your choice at BB, where you can return it easily if you don’t like it. Here’s a tip for you: the Finder is actually pretty good at viewing/playing files without opening the file in the app that created it. Pick an mp4 or wave file. Click ONCE on it. Hit the space bar. It’s called Quick Look. Caution: the Finder no longer plays MIDI files, nor will it play highly proprietary files, ie, it will not play MuseScore. The window that the Finder opens is completely resizable so give it a try! Just What is this AjamSonic Thing? Ketron SD9 / SD60 / SD90 Technical Support – Coming Soon! Jim Krause on Launchpad Questions, Feedback and Thoughts. immusic on Launchpad Questions, Feedback and Thoughts.